Mutran sweets is one of the best places to try Arabic sweets delicacies. In the store there are dozens of different cookies and other sweet treat, neatly arranged for you to pick and enjoy at home. In case you feel like trying out the sweets there, Mutran also has a cozy and air-conditioned space where you can sit and enjoy one of their treats. Recommended very much is the sweet and savoury knafe, crunchy angel hair noodles covering goat cheese inside, served warm. 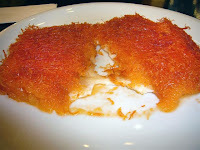 The malabi is also one of the best in Jaffa. The tea and coffee are a bit pricy there, though usually extremely fit the desserts. Take bus 25 towards Jaffa/ Yafo, go down at the fifth station on Sderot Yerushalaim (at no. 134). Go a bit backwards and take left at Bat Ayin st. Go up straight till you hit a main street, Yefet. There take left, and it should be on your left. * Note: The coffee and tea are not for free.